The last case for Silver. Even more than ever I feel very strongly about this topic. At a time when public sentiment is pretty much the worst it has ever been concerning precious metals I am even more confident in my beliefs, in history and in facts. Weak hands give way to pressure, emotion, public sentiment, and propaganda. Strong hands hold tight to prove themselves and eventually profit greatly. Those of us who are silver stackers feel beat up and torn down over the last several years as we have watched the price of silver go up and down. Just as it appears that price is about to break free of the manipulation and set new highs they are again and again smashed down below trend lines. There’s no difference in these conditions even today unfortunately. It’s not possible that we, and history, are wrong is it? Have things changed so much that there is no longer a place for real money that is gold and silver? Well, one thing that is different is our attitude. And it’s not for the worse. We are not just watching and hoping for the price to only go up but rather to stay down a little longer so that we can acquire more at bargain prices. The case for silver keeps getting stronger even as we watch retail public sales of silver coins and bullion dwindle dramatically, down significantly from previous record high sales of the past few years. The fundamentals of every market except precious metals have gotten weaker while the case for gold and silver get ever stronger. So, what’s the problem then? Why do all of these supposedly intelligent investment managers, advisers, bankers, traders, other financial professionals and even common citizens continue to avoid physical precious metals? It’s actually quite simple. The answer to all of the above questions is one word; Debt! Our “economy” is driven by and based on debt. It is fueled by debt and functions only as intended and ultimately designed to; through debt. It grows only as debt increases. You see, gold and silver are the exact opposite of debt. They are real money. They are real wealth. They are the antidote to debt and thus the kryptonite to debt. When you hold them in your hands, when you take possession of them they are no one else’s liability. There is no counter party risk. There is no risk in owning gold or silver at all. I take that back. There is one risk, and one risk only; that they may be physically stolen if not stored correctly. Let me make this crystal clear. Along the top of every US currency bill are the words “Federal Reserve Note”. What is a “Note”? A “Note” is a loan contract. It is a document that controls. It creates indebtedness. Although it is not secured by anything specific the currency is still owed. Owed to whom you ask? Why the lender of course, which is the Federal Reserve. And get this; it’s owed back with interest due for its use. So, not only is that paper dollar bill you hold subject to inflation and devaluation but also subject to the cruel master that is interest. Debt is the problem. In order to manage the tremendously large levels of debt, public and private, along with its accompanying interest owed by virtually every person, business, city, county, state, country, investor, retailer, wholesaler, speculator, manufacturer, developer, etc., etc. they must all chase profits. They must make a yield, a return higher than the interest that is owed on the borrowed currency. This cannot be done with physical gold or silver. Gold and silver by themselves do not pay dividends and they do not earn interest. They are not meant to, yet neither does the paper currency in your wallet either. In order to make a return on any currency or money it must be exposed to some amount of risk. Taking your cash (US currency) and putting it in a bank, even if just to earn a severely low interest rate in compensation for the bank to use your currency however they see fit, is putting it at risk. If you didn’t already know, when you deposit your currency in a bank you are no longer considered a depositor but rather an unsecured creditor subject to the risks the bank takes and it’s losses. The case for silver in particular couldn’t be stronger. 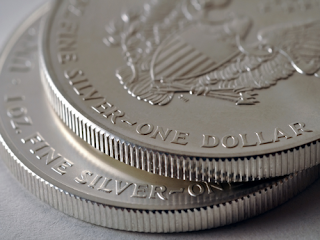 Silver has been used as money longer and in more transactions than gold ever has. Gold is the money of kings. Silver is the money of the people. A man’s wage for a hard day’s labor or a soldier’s payment for a day was for many hundreds of years approximately one tenth of an ounce of silver. What value would that equate to you for a full twelve hours of your work? What would that equal in US dollars? That is a hard question to answer primarily because the US dollar has lost nearly 100% of its buying power since it was created in 1913 with the beginning of the Federal Reserve. When a dime was made of 90% silver you could buy a gallon of gas with it. Now, a tenth of an ounce of silver will still buy you a gallon of gas. That is the power and the value of silver. In truth it is not subject to inflation, deflation, or devaluation. It is the purchasing power of the dollar and other fiat currencies that is. Not only is silver real money, unlike in days long past, it now has almost as many industrial uses, and is as vital to the world economy, as is oil. This demand, along with increasing investment demand and declining silver production will ensure that the value of silver, as measured in US dollars, has nowhere to go but up in value as related to fiat currencies and wealth preservation. Now, in our generation because of the excessive debt levels, owning silver will result in extreme wealth creation. Because the current levels of debt, which is the opposite of money, are astronomical and continue to rise, the value of silver on the other end of the spectrum will become so valuable as to equal its exact opposite. Imagine light and darkness; darkness being debt and silver being light. The value of real money will be equal and opposite to the extreme level that is world debt. These are a few of the reasons why both gold and silver are so heavily manipulated and controlled. Those who understand this are buying. Those who don’t are selling. So, who is buying? China, Russia, India, and many other countries in the East are. As much as they can get their hands on while these artificially low prices persist and until they can no longer be acquired. Less than 1% of Americans own any gold or silver other than jewelry. Now, imagine if this demand were to simply double. Where will prices go then? Would you even be able to get any for yourself? I imagine not. Do the current turbulent conditions of the world indicate to you that maybe you should get out of the debt trap and acquire some real wealth? For me they do. Another reason to buy silver over gold is the gold to silver price ratio. Gold and silver are mined at a ratio of about nine ounces of silver to every one ounce of gold. The current gold to silver price ratio is around seventy-five to one. Even historically for hundreds of years it averaged sixteen to one. This simple fact alone makes silver much more attractive than gold from an investment or speculation perspective. When the price of silver returns toward its natural balance the gains will be far greater than if you saved your wealth with gold. Do yourself a favor; take my advice. Become your own bank and begin exchanging some of that counterfeit currency in your wallet for some real money. If you don’t hold it you don’t own it. Today may be your last chance.